Yea...bout all I can do without a reference walt..
noewss! San Diego is EVIL. D: the weather here so random and inconsistant. Though, today there was a nice warm sea breeze, so I opened the window. =w= soo nice. leet huh..lol thanks GW just doodling to kill time.. This is soooo tight! It should have been a contest entry! Surely a 'Showcase entry' if you ask me! Maybe the colds effecting me, but it looks like a chilly day. And your boats, you have a boat fixation :). I think one day we have to collab Dave. I do the sky and water, you draw one of your boats. Thanks! Is that OUR gloworm??? Wow. LTNS! WB! Barb.. or..we could just draw Sasquatch..and tell everyone it's Marcello! 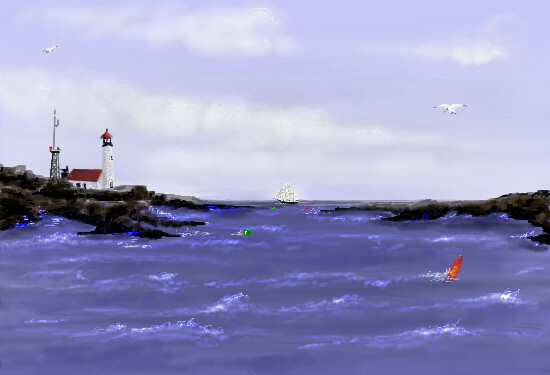 Man I shouldn't look at the thumbnail at 4:00 in the morning, I thought it was my request painting and the red thingy was a periscope of a sub running into a boat (lighthouse) Maybe I should go to bed.